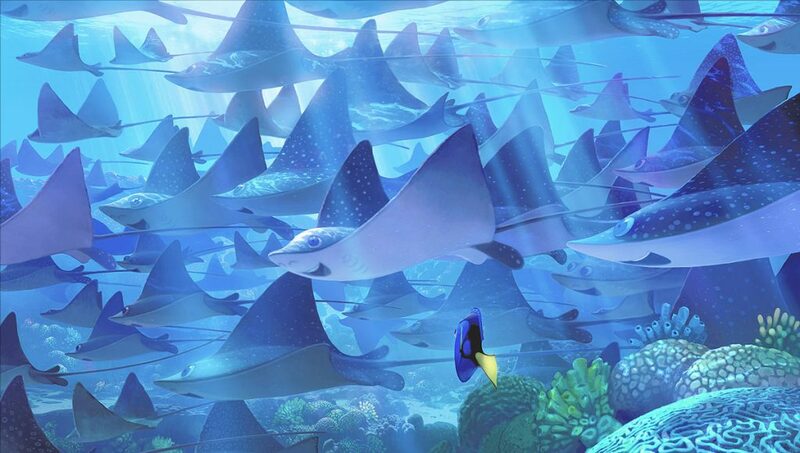 Thousands of pieces of artwork play a significant role in the planning process of what a Pixar film’s characters will look like and what the story of the film will be. Concept art is often one of the first pieces of the films that the public gets to see because they are simple yet stunning pieces that provide just enough of a peek into the world of the films – the great art books that are released to accompany the films confirm that much. Concept art is beautiful to admire in a book, but imagine being able to gawk at them in a limited art installation. Oh My Disney! has an exclusive look at all 17 pieces of concept art that will be on display for visitors to Gallery Nucleus in California. If you are thinking that the number 17 sure sounds like the number of Pixar films that have been released, you would be correct – there will be one piece of artwork for each of the feature films in the studio’s catalog. Studio Chief Creative Officer John Lasseter hand-picked which art piece would represent each film. The exhibit opens at Gallery Nucleus tomorrow, December 9th. It runs through January 8th. Select Pixar artists will also be in attendance. For more information about visiting Gallery Nucleus head over to their website.